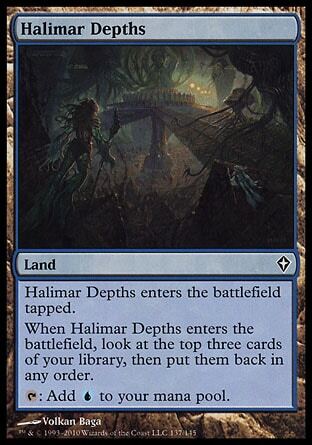 A pre-Worldwake look back at post-Zendikar blue. Blue was never bad. Just not as good as we’re accustomed to. A 450-lb man who loses 150 lbs—a full 33% of his body weight—would certainly not be considered “skinny” by any means. This, I feel, sums up the current state of blue in Standard. While blue may have been worse between October and January than it ever has been, in hindsight I think it was a mistake to say it was “bad.” Counterspells were narrow and card-drawing was much less effective, true, but the color still had its strengths. 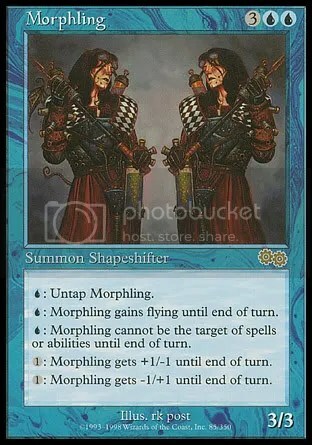 To wit: There was a time when many considered Morphling to be the best creature ever printed. With a wealth of abilities previously unheard of, Morphling could pump itself to 5/1, stack damage, and then become a 1/5; it could gain Flying; it could gain Shroud. It could untap itself, doing a passable impression of Vigilance. Still, the Sphinx exemplifies the quintessential blue finisher quite nicely: difficult to block, and easy to protect. 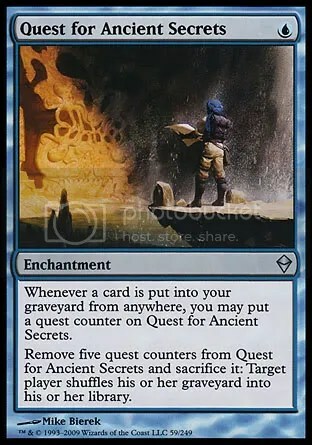 The difference between pre-Zendikar blue decks and those we’ve seen of late, as Conley goes on to point out, is that usually the counterspells are more versatile. This allows them to appear a bit earlier, as their answers don’t have to be so specifically tailored for the metagame. It is this loss of versatility, coupled with the loss of Instant-speed library manipulation, that fueled the perception of blue’s demise. So, now we have Worldwake. Now we have the Mind Sculptor himself to help sculpt our hands into the ideal mix of answers and threats. We can dig for Treasure in the Halimar Depths, and accelerate our mana by drinking from the motherlovin’ cup. BLUE IS BACK!!!1!! Not so fast. Let’s take a step back. 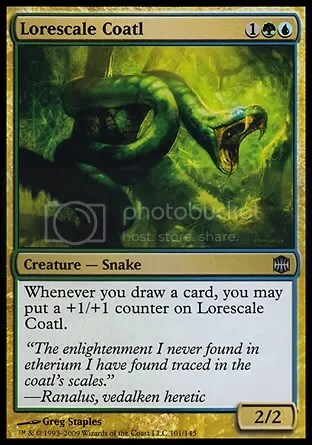 Blue mages—like starving children in a frenzy over a hunk of stale bread—have managed to drive the price of Jace, the Mind Sculptor to near-Baneslayer levels. I’m not exactly saying the price is unwarranted, because the card is certainly a piece of beauty, and I hope it’s every bit as good as people are expecting. But it has yet to prove itself. Had JtMS been released while Lorwyn was Standard-legal, I’d have been surprised to see it reach a pre-sale price half as high as it’s seeing now. Worldwake is certainly giving blue a nice shot in the arm, don’t get me wrong. But I think we’re putting the cart before the horse, here. Blue mages are feeling so under-nourished from Zendikar that what may turn out to be a Happy Meal is looking like Thanksgiving Dinner. So yes, go test your blue-based control decks. Play your Jaces, and your Treasure Hunts (I know I will be). But don’t set your expectations so highly that anything less than “bah-ro-ken” is a disappointment. I don’t think Mono Blue Control will be a reality, but pair it with a pal and I think blue control decks will be just fine. A Yo! MTG Taps! Video Supplement – Coverage of the Worldwake Prerelease! Recorded at Dream Wizards Games in Rockville, MD. Apologies for low audio. We recorded with an iPhone, and I did my best to try to clean it up, but it’s still a bit iffy. No footage of actual games, but hosts BigHeadJoe and Joey talk a bit about their experiences at the Magic: The Gathering – Worldwake prerelease. Yo! MTG Taps! Episode 7 – Now Available! Yo! MTG Taps! Episode 7 – Top Fives! is now available for download! Check it out over on MTGCast! Follow us on Twitter @YoMTGTaps or @AffinityForBlue. CURRENTLY READING: Peter & Max: A Fables Novel. Forgive me for posting this after about 15 seconds of actual thought, but I just wanted to throw the ideas out there for all you innovators. This is what we have so far from The Planeswalker Chase, the newest buzz-generating scheme cooked up by WotC marketing. Obviously I’m pretty excited, not only because it’s blue (IT’S BLUE!) but this is also the first planeswalker with four abilities instead of the usual three. I don’t know about anyone else, but I never even considered more than three a possibility. Nevertheless, here it is. 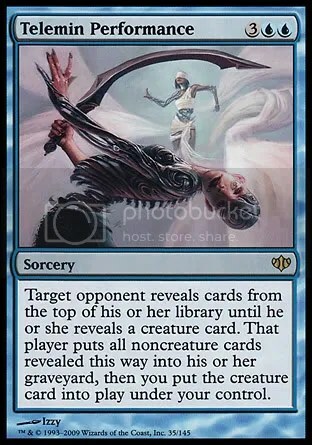 +2: Look at the top card of target player’s library. You may put that card on the bottom of that player’s library. +/- ? 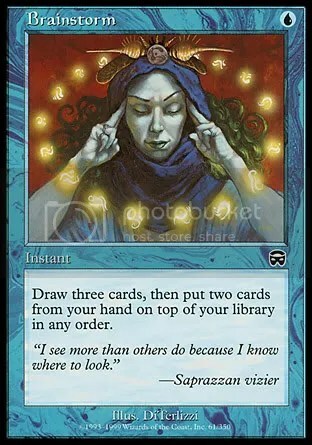 : Draw three cards, then put two cards from your hand on top of your library in any order. +/- ? : Return target creature to its owner’s hand. +/- ? : Exile all cards in target player’s library. Then he or she shuffles all cards from his or her hand into his or her library. Yes, that second ability is Brainstorm. 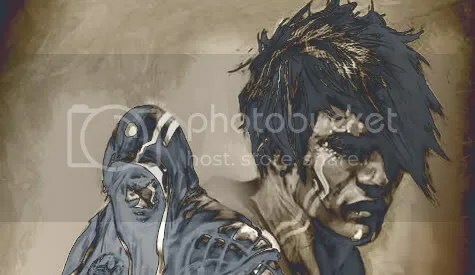 From what we can see, it also appears to be a “minus” ability rather than a “plus” ability (the shield does not appear to have an upward slope); however, there is speculation that perhaps the second ability is neither a minus nor a plus, and is simply “0.” This would be another new feature on a planeswalker, and I wouldn’t put it past Wizards to do something like this. In any case, we’ll know the full card in a matter of hours—the final two pieces are in Canada and California, and should be spoiled later today. UPDATE! : Here’s the full card! Back when Alara Reborn hit the internets, Lorescale Coatl was spoiled, and one of the cards that immediately started popping up in discussion was Brainstorm. Unfortunately, while we don’t actually get Brainstorm itself, a Coatl in play alongside Mr. Mind Sculptor here will tend to get really big, really QUICK. +4/+4 per turn quick. Might we see the return of a Miracle Grow style deck? We’ve already got Scute Mob, who fits the theme quite nicely. 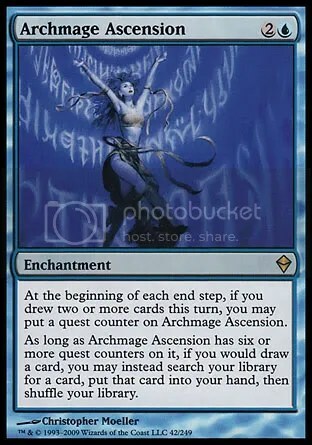 Earlier, I was going through some of the images I had saved back when Zendikar was being spoiled (images that I’d planned on using in posts to discuss the new cards), when I noticed Archmage Ascension. The new Jace’s Brainstorm ability could help get the Ascension online—perhaps in an Esper deck with Courier’s Capsules and Esper Charms to add counters to the Ascension during your opponent’s turns. As I said, I haven’t given it much thought, but I’m throwing it out there as something to consider. As I mentioned on Yo! 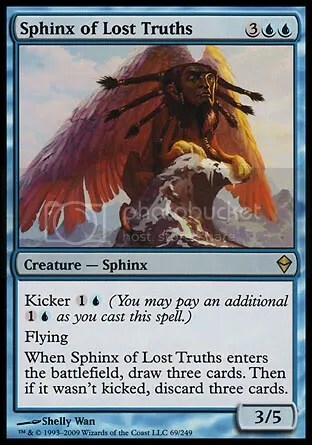 MTG Taps!, I have been thinking quite a bit about the “other” Zendikar sphinx, Sphinx of Lost Truths. 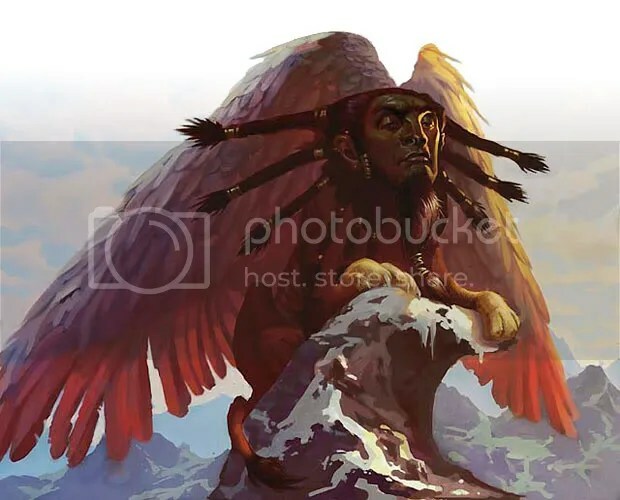 While I think this was the first sphinx to get any love (Gavin Verhey included it in a Sphinx Control list just after Zendikar’s release, and it was in a deck that made the top 8 of a Last Chance Qualifier for Pro Tour Austin), it seemed to quickly be overshadowed by its bigger untouchable brother, Sphinx of Jwar Isle. True, it did see the light of day in a few Dredge lists at Pro Tour Austin, but I can’t help but think there’s great potential for this guy in Standard. This was the list I originally planned on running when Zendikar first hit the stores. However, Richard Feldman presented such a great argument for his URW “Rembrandt” deck that I switched to his list before I even got a chance to try Gavin’s. After feeling like the Feldman list was lackluster, I switched to a Kyle Sanchez version of Izzet Control (UR), cutting the white for more mana consistency. Of course, as I stated a few weeks ago, that version seemed to be a bit deficient as well. I never felt like I had the right answers in my hand. Last week I asked Gavin whether he felt his Sphinx Control deck was still a viable choice for Standard, and he pointed me to Patrick Chapin’s Wafo-Grixis build (it’s technically Guillaume Wafo-Tapa’s Grixis list, with a few modifications by Chapin). If you read Lloyd Frias’ tournament report, you might recall that this was the list that he used as the basis for his States-winning deck. In the meantime, I’ve been working on my own build of Cruel Control, which—after suggestions and playtesting—has slowly evolved to be quite similar to the lists above. As you might expect, the deck is constantly evolving. 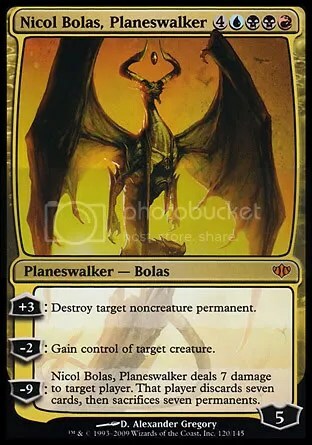 The most recent changes were cutting Sign in Blood for Courier’s Capsule, and shaving a Countersquall and a Double Negative to fit Sorin and Bolas. (These changes came after talking to Lloyd about his card choices on Yo! Ep 6). So far, so good. 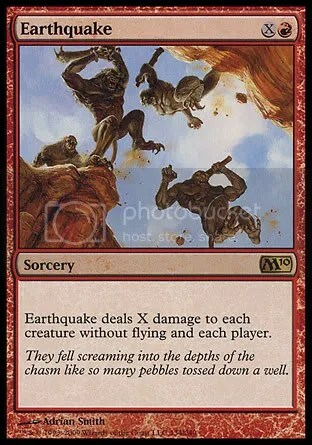 I’m liking Sorin and Bolas, but I haven’t played Capsule enough to notice a big difference between it and Sign in Blood. On the Top8Magic podcast, Mike Flores mentioned that when he designed Naya Lightsaber, he made sure not to run any lands that didn’t at least have a good chance of coming into play untapped (ie., the M10 duals). The more I thought about this strategy, the more I wondered: Why couldn’t this work for a control deck? The resulting manabase I’ve come up with has only two lands that enter the battlefield tapped (Crumbling Necropolis). For me, this—along with running a sizable amount of instants—has worked WONDERS. Being able to interact in the early game has been crucial. By allowing me to have an impact before my big spells are online, this mana configuration forces my opponents to keep applying pressure in order to have any chance of winning, and helps set me up for the late game, where the deck shines. 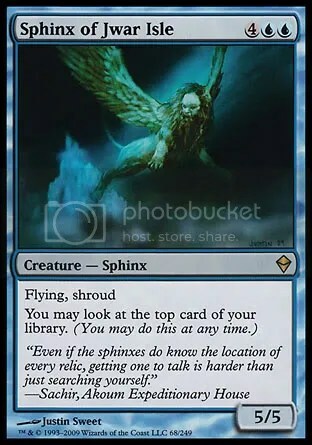 There is even the possibility of a turn 5 Sphinx of Lost Truths, turn 6 Sorin (drop them to 10, swing for 3), turn 7 Cruel Ultimatum + swing or ping with Sorin for the win. 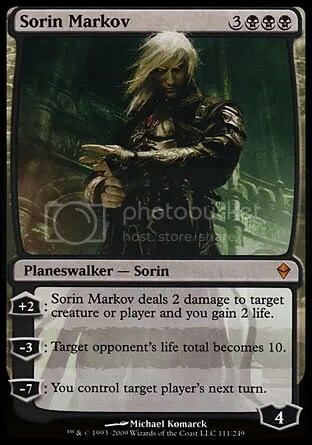 Obviously, with only 1 copy of Sorin in the deck, it’s not going to happen regularly, but the potential is there. This deck just feels so much more powerful than the Rembrandt and Izzet versions. I no longer have to rely on attacking with Sphinxes to win games; I have Sphinxes, Planeswalkers, and oh, that’s right, Cruel Ultimatum. Before, I was playing my ‘walkers out of necessity, because there was a threat that needed to be answered. Chandra was there to kill a Baneslayer and then die to any Llanowar Elf that was in the mood for a tussle. Ajani Vengeant (while still awesome), was difficult to protect when my own life total was in danger. But in this deck, the ‘walkers are threats in and of themselves. Now, just a few stories from tonight. Iona, Shield of Emeria is REALLY frustrating to play against. My opponent was playing a GW Summoning Trap deck, which would ramp up into Summoning Trap or, more often, Iona herself. It seemed like every time I tapped out for something, he would have the Iona or the Trap. With so much mana, hardcasting either spell was not a problem. In one game, I tapped out for Nicol Bolas and stole his tapped Rhox Meditant (my other choice was Birds of Paradise). At the end of my turn he plays Summoning Trap and gets a Rhox Meditant. On his turn he hardcasts Iona (naming black) and then attacks with Meditant into my Bolas, putting him on 1 loyalty and leaving me unable to deal with Iona. In two separate games I managed to destroy his Iona, only to see another one hit the board on his subsequent turn. I kept wishing for Into the Roil (which I had just removed from the sideboard because I had yet to use it). It’s likely I’ll remove the Spreading Seas from the ‘board to make room, because so far it hasn’t impressed me. Also, tonight I had the opportunity to play against the Jacerator (TurboFog) deck that’s been seeing a lot of play. In game one, he rolled me. I tried to put up a fight, but I just had too many dead cards against that strategy (Flashfreeze, Terminate). In game two, however, I won on turn 5. You see, I had noticed the 1 copy of Telemin Performance in Lloyd’s sideboard, and I thought it was a decent card to try out. I sided it in for this matchup expecting to steal a Sphinx of Jwar Isle, which I knew my opponent was running. But lucky for me, he had sided it out. On his turn 4 he tapped out for Font of Mythos and passed the turn; I untapped and played Telemin Performance, and that was game. He had zero creatures in his library. Very exciting. It’s rare that one single spell wins the game on its own in one turn. WOW. In game 3, he sided in Quest for Ancient Secrets to deal with the possibility of another loss to Telemin Performance. We battled back and forth a bit, and in the end, I was able to come up with enough burn to end the game before he could put together his combo. Because I hadn’t played any creatures thus far in the match, he sided out his removal and most of his fogs. I got there with Sphinx of Lost Truths + 2x Lightning Bolt + Earthquake (and a few timely counterspells, including a Double Negative for his Negate when he tried to counter my game-winning Earthquake). Overall, a really fun evening of Magic. For the first time since Zendikar’s release, I feel like I have a deck that both fits my play style and has cards that I enjoy playing. Here’s to hoping Worldwake has some goodies in store for us island-lovers. $1,000 purse is guaranteed, additional prizes will be awarded based on attendance. Doors open at 9:00 a.m.
For more information, visit BaltimoreMTG.com. CURRENTLY READING: Jonny Magic & The Card Shark Kids: How a Gang of Geeks Beat the Odds and Stormed Las Vegas. Yo! MTG Taps! Episode 6 – Now Available! Yo! MTG Taps! Episode 6 – UnderStatements is now available for download! Interview and discussion with the winner of Maryland States 2009, Lloyd Frias! 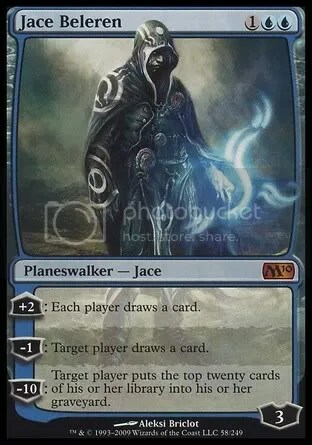 Recently there’s been a bit of discussion on Twitter between myself, @winsteadt, and @mtgsalivanth regarding the best strategy for playing Jace Beleren. When he was first released in Lorwyn, initial reactions were mixed. The conflict between keeping Jace out of burn range with his +2 ability while also gaining some card advantage (and thus NOT giving your opponent a card) had players wondering what exactly the correct play should be. Now, after two years in Standard, the question is still likely to get different answers. While there are going to be cases where the opposite is true (namely when playing against a deck with few creatures and no burn), my usual strategy for playing Jace is to use his +2 ability immediately, putting him at 5 loyalty. This keeps him out of range of the most common burn spells and relatively safe from most creatures. If my opponent wants to commit an entire turn to attacking Jace, or wants to use two burn spells to take him out, then I’m fine with that. More often than not, though, putting Jace up to 5 loyalty allows me to get at least another card out of him, and even at 4 loyalty he’s not easily dealt with. At this point, although this is dependent upon the state of the board and my opponent’s hand at the time, I’ll usually just draw cards off Jace until he’s at 1 loyalty. If I have another Jace to play, I’ll draw that last counter and play a new Jace; otherwise I might put him back up to 3 counters and give my opponent a second card. By this point, however, I’ll have drawn six cards from Jace to my opponent’s two! 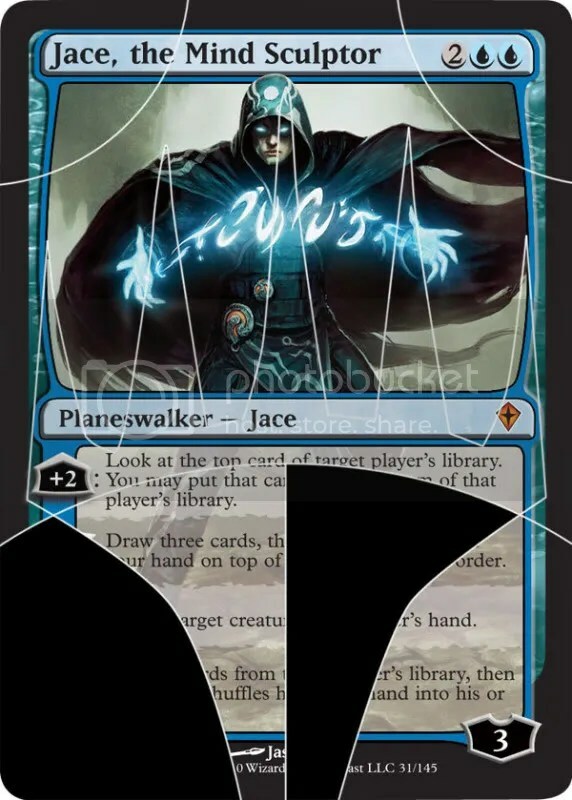 As you can tell, things can really get out of hand if Jace is left alone. At his worst, with this strategy Jace breaks even, replacing himself and causing your opponent to either use their extra card to remove Jace or use their attack for the turn to get rid of him (essentially gaining you 5+ life). 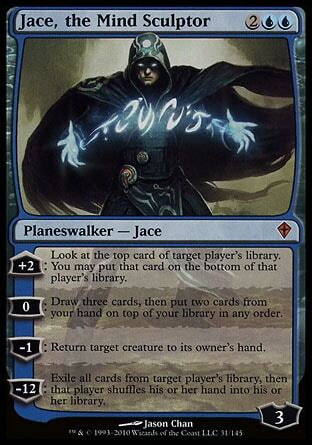 Anything beyond that is extra, which is what makes Jace such a strong card (and I feel he’s still underrated).